On the 18th of April 2013, Aura Athletica launched their newest yoga apparel by Zobha and the maiden issue of Athletica wherein yours truly was privileged to contribute. The launch had a short fashion show sampling the new designs and introduced the avid shoppers turned yoga ambassadors. 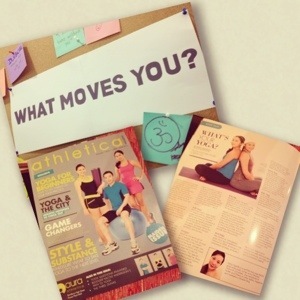 Join the Aura Athletica campaign by contributing through social media sites: What moves you? We were fed by such sumptuous healthy vegetarian treats from PINO restaurant and left the launch with a huge smile on our faces as we were gifted the bobble bottle together with a performance headband fit for our yoga practice. You may visit Aura Athletica stores at Rockwell center or along the middle strips of BGC.